DriveHQ's WebDAV Drive Mapping offers a smooth migration path to the cloud. Employees can continue using the same network drive letter(s) and business software as if nothing has changed. No training is required. For enterprises that use Active Directory, DriveHQ natively supports AD Integration and Single-Sign-on. Users can continue logging on using the same email address and password on their domain. Microsoft Office has several compatibility issues with regular WebDAV, such as special characters in file/folder names, the length of file paths, file corruption and constant logon prompts, etc. DriveHQ's Enterprise WebDAV Drive Mapping Solution is much more robust than regular WebDAV solutions, including group management and provisioning features to replace in-house file servers and SharePoint servers in an enterprise. 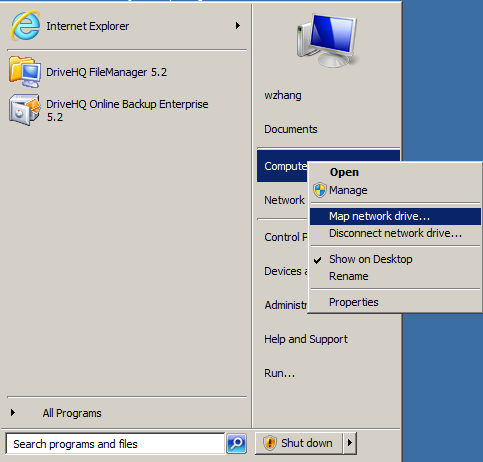 On Windows and Mac, the easiest way of mapping DriveHQ cloud drive is to use the Drive Mapping Tool. The tool not only makes drive mapping extremely easy, it also includes additional reliability and performance enhancements, plus management and provisioning features that make it perfect for enterprises. You can configure all users to automatically map certain cloud folders to certain drive letters. Note the drive mapping tool is not required. If you cannot install the tool due to access restriction or company policy, you can directly map a drive using a Secure WebDAV URL. At this time, we don't have a drive mapping tool for other platforms. However, users on Linux and other platforms can easily map a drive using a Secure WebDAV URL. Please read Section 3 for more details. Download the Drive Mapping Tool for Windows/Mac, then run the installer. After it has finished installing, you will be able to map a WebDAV drive by entering your username and password. By default, you map your entire account as a network drive, which includes both "My Storage" (the root folder of the mapped drive, e.g.M:) and "DriveHQShare" (a special virtual folder in the mapped drive, e.g.M:\DriveHQShare). "My Storage" is like "My Computer", which includes all files and folders belong to your account; "\DriveHQShare" contains folders shared to you by other users. These folders usually do not belong to you. You can map to a specific folder in your own account, or a folder shared to you by entering the folder path. To map a folder in your own account, just enter the folder path, see the screenshot below. To map a drive containing all folders shared to you by one user, enter the path as: "\DriveHQShare\USERNAME"
Most WebDAV services don't allow mapping multiple drives. However, with DriveHQ's enterprise WebDAV service, you can map any number of cloud drives. Be able to map multiple drives can be very convenient for most users. For enterprises, it is particularly useful if you want to replace your local file server with our cloud based file server. Most enterprises organize different business files into different mapped drives. Migrating to DriveHQ's cloud service can keep exactly the same file structure and drive letters. This offers a smooth migration path to the cloud. To map multiple drives, you just need to click Map Drive again in the tool, then enter the path to map, then click "Map Drive +" again to map the drive. This feature is extremely useful to large enterprises. DriveHQ has a very powerful group admin tool, which supports creating and managing sub-users and sub-groups; it also supports sharing folders to different users with different permissions. For detailed information, please read DriveHQ service manual. The second parameter MapDefaultDrivesAutomatically can be set to true or false. If it is true, then when a sub-user logs onto the WebDAV Drive Mapping Tool, it will automatically map the listed drive letters for the sub-user. Please note this only sets the default drives for sub-users. Sub-users can still map drives themselves. If you want a sub-user(s) to automatically map different drives, you just need to create such a configuration file in the sub-user's "\DriveHQData\WebDAV\" folder. The drive mapping tool can only logon to one user account at a time. It can map folders from different user accounts if you share folders to this user account. Without sharing folders to a user, the drive mapping tool cannot map folders from multiple users. You can use the WebDAV URL to map to multiple user accounts directly. In any case, running the drive mapping tool at least once is recommended as it includes performance and reliability enhancements. After you have run the tool once, you can use the WebDAV URL to map the drive, and the result will be the same as using the tool. 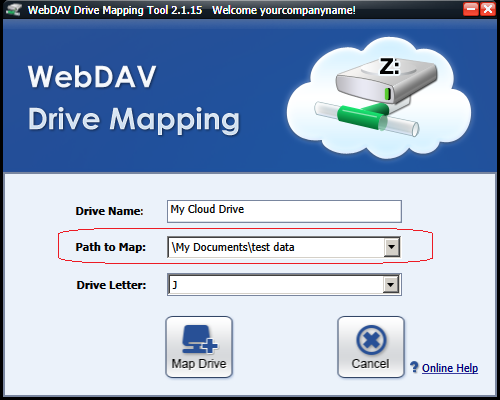 The WebDAV Drive Mapping Tool is available on Windows and Mac. 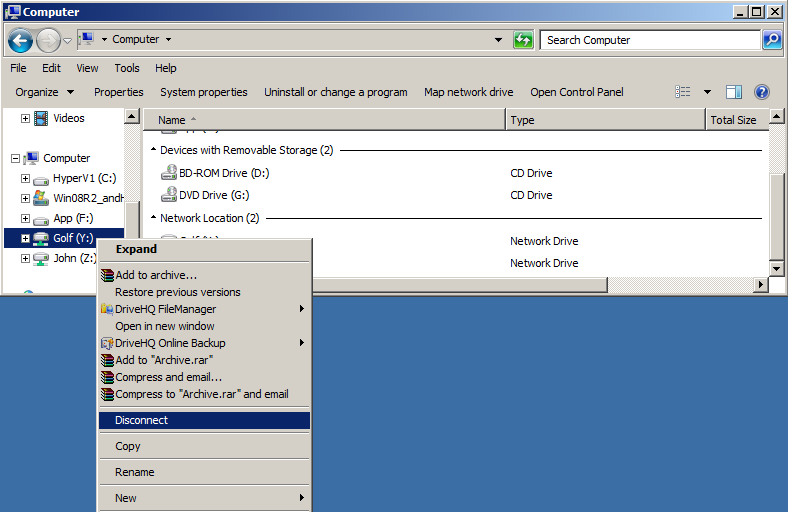 While you don't have to install the tool to map drives, it is strongly recommended installing the Drive Mapping Tool. To map a drive directly using a Secure WebDAV URL works on most platforms, incl. Mac, Linux, Windows and Windows RT, etc. Certain platforms may not natively support WebDAV, if it has a WebDAV client application, most likely the Secure WebDAV URL will work fine with the WebDAV client (e.g. it works with Office 2 HD on iPad). By default, the new WebDAV Security Key is restricted to this Public IP address only, which means you can map a WebDAV drive only from this public IP address. A public IP address is offered by your ISP (sometimes called as a static IP address, or a WAN IP address). It can directly access the Internet. Please note your computer usually has an internal IP address (such as 192.168.*. *), which is not the same as a public IP address. An internal IP address cannot directly access the Internet; it must go through a network router or proxy server with a WAN IP address. If your computer accesses the Internet through a router or proxy server, then it uses the router or proxy server's Public IP address to access the Internet. If multiple computers use the same router or proxy server to access the Internet, then they use the same public IP address. To find your public IP address, you can launch a web browser and search for "What is my IP address". 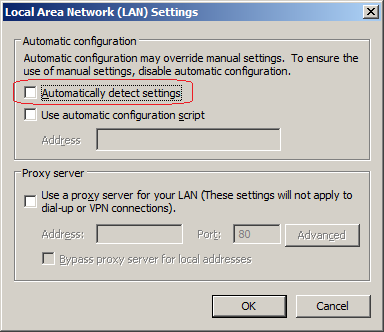 If you will use WebDAV from this public IP address only, then the default setting is fine. If you need to use WebDAV from different locations or if the public IP address is dynamic, then usually you should remove the IP Restriction so that you can use WebDAV from anywhere. Click "Unrestrict" to remove the WebDAV IP restriction. You can also create multiple WebDAV Security Keys for different Public IP addresses. The tool currently does not support IP ranges. It will be added in the next version. If you need to restrict the WebDAV URL to an IP address range, you can send an email to DriveHQ customer support. 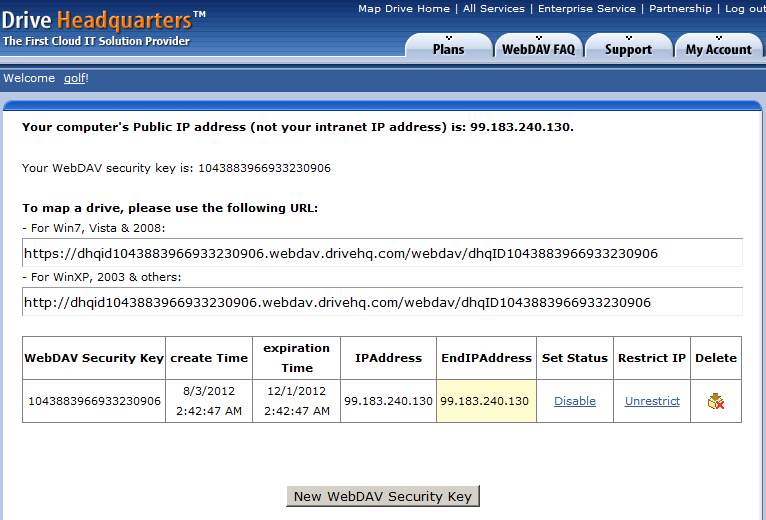 Caution: A secure WebDAV URL is used to map a network drive to your DriveHQ cloud storage. It is very important to safeguard your WebDAV Security Keys / WebDAV URLs. It is even more important if you remove the IP restriction. To avoid leaking your WebDAV Security Keys, use the HTTPS-based WebDAV URLs whenever possible. It is also strongly recommended to change your WebDAV drive label so that it does not display the key. When using the drive mapping tool, the drive label is changed automatically so that it does not display the WebDAV security key. You can select a drive letter; and if you want to automatically map the drive after you reboot your computer, you just select the checkbox "Reconnect at logon". Click on Finish, a new WebDAV drive will be mapped. No user authentication is needed because the WebDAV URL already includes the "WebDAV Security Key" which contains the user authentication information. You can now use the new WebDAV drive like any other drives. Enter a new Drive label (name), e.g. "Golf", apply it. 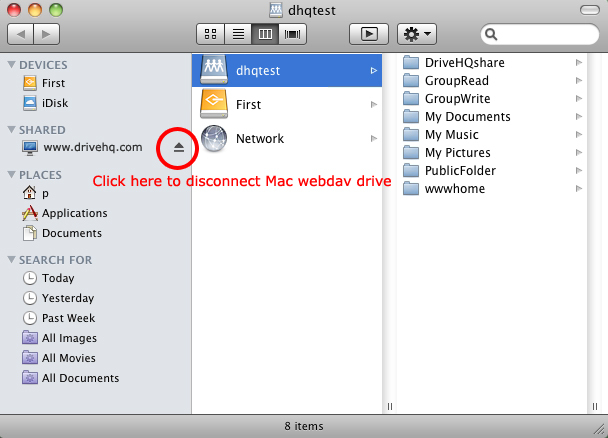 Now the WebDAV drive is displayed as follows: "Golf (Y:)"
To disconnect a WebDAV drive, you just need to right click on the drive letter, and then select "Disconnect" Please see the screenshot below. Where Y: is the WebDAV drive to be disconnected. 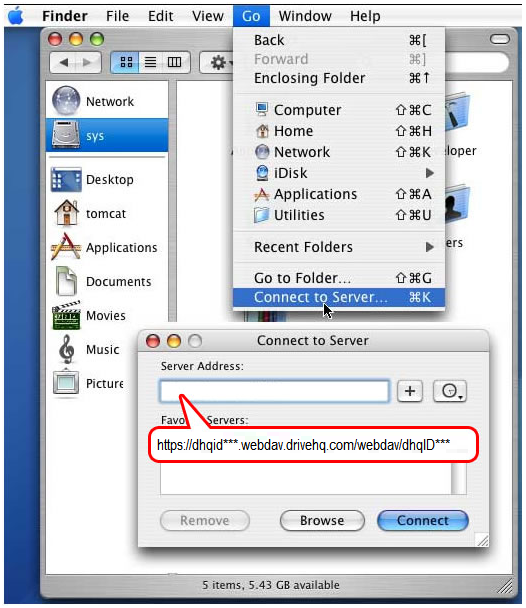 To map a WebDAV drive on Mac OS X, open Finder first, then click on Go ⇒ Connect to Server command as shown below. In the popup dialog, enter the Secure WebDAV URL in the Server Address field. The address should be as shown above. Then click on Connect to finish mapping the WebDAV drive. The WebDAV client software on Mac tends to be not as efficient as FileManager or FTP. If you experience slow performance, then you can consider using DriveHQ FileManager or other FTP client software. DriveHQ's Enterprise WebDAV Drive Mapping Solution works on Linux. Please note DriveHQ uses a fine-granular ACL-based access control system, which is not the same as Linux / Unix based file permission system. After you map a drive, you cannot use CHMOD to change file / folder permissions. As long as you map the drive and access it from the same Linux / Unix user account, you should be able to access the mapped drive. Here the URL is your Secure WebDAV URL, and /drivehq is your mount point (must be an empty folder). The WebDAV client software on Linux tends to be not as efficient as FTP. If you experience slow performance, then you can consider using FTP. There are two ways to map multiple drives to folders in multiple accounts. This is the only method if you use the Drive Mapping tool as it can only logon to one account at one time. If you map drives directly using the secure WebDAV URL, you can map to folders in multiple accounts directly using the secure WebDAV URL generated in different accounts. Again, it is recommended using the drive mapping tool at least once for better performance and reliability. If you use the WebDAV Drive Mapping tool to map a drive, then you don't need to read this section. Otherwise, this section provides a very minimal but important performance tuning. On computers with IE 8.0 or higher version, you may experience very slow WebDAV performance. This appears to be a Windows bug. To solve the problem, you just need to turn off IE's "Automatically detect settings"
After you click on Internet Options, Click on the "Connections" tab. See the screenshot below. Then click "LAN Settings". 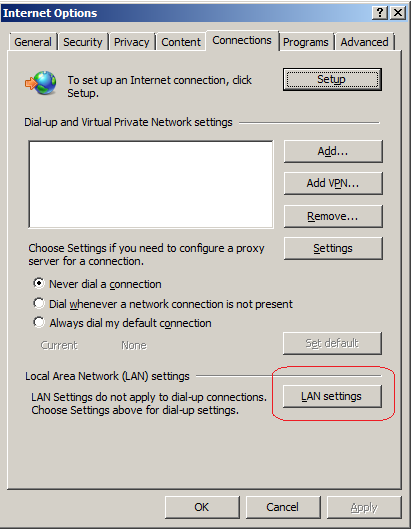 It will open up a new "Local Area Network (LAN) Settings" dialog. See the screenshot below. For best WebDAV performance, please make sure to clear the checkbox "Automatically detect settings". Click OK to apply the change. You will notice WebDAV is significantly faster. WebDAV Cloud Drive is the most straight-forward way of accessing cloud files. However, WebDAV has a few inherent issues. While DriveHQ's Enterprise WebDAV solution solved a lot of these problems, it may not be the best way to access cloud files in certain cases. To solve these problems, you can use DriveHQ FileManager and WebDAV at the same time (for different scenarios). If you use WebDAV cloud drive for office documents, PDF files, text files, HTML files and image files, usually you will not run into any problems. In this case, you don't need to read below. The progress bar quickly moves to the end; however, at this point, it has only finished copying the file to a WebDAV local temp folder. Then the WebClient service (part of the operating system) starts uploading the file to DriveHQ WebDAV server. If the file is large, it could take a long time for the progress bar to update. (3) When downloading a file over 50MB from a WebDAV drive, you might see an error message: "An unexpected error is keeping you from copying the folder / file... The file size exceeds the limit allowed and cannot be saved." Please see the screenshot below. This is a WebDAV client (i.e. 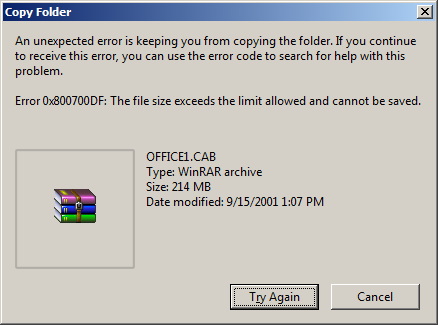 Windows Explorer) problem. Fortunately, it can be fixed by modifying two registry keys. You can change the value to 400000000 (400MB). Changing the value to 2000000000 (2GB) might still work, however, for files over 400MB, it is strongly recommended using DriveHQ FileManager or FTP. WebDAV is definitely not optimized for transferring such large files. You can change the value to 7200. Changing it to a bigger number might still work; however, it is strongly recommended using DriveHQ FileManager or FTP for uploading such large files. To fix the registry key using a script, you can copy the following text into a new text file, and name it as "IncreaseWebDAVMaxUploadDownload.vbs".
' Modify the registry to allow WebDAV drive uploading a single file that takes up to 2 hours.
' Modify the registry to allow WebDAV drive downloading files up to 400MB. Then double click on the file in Windows Explorer to run the script file. After the registry key has been changed, you must restart the WebClient service, or reboot your computer. (6) WebDAV cannot upload files larger than 2GB. In fact, if your file size is over 100MB, it is strongly recommended using DriveHQ FileManager or FTP. 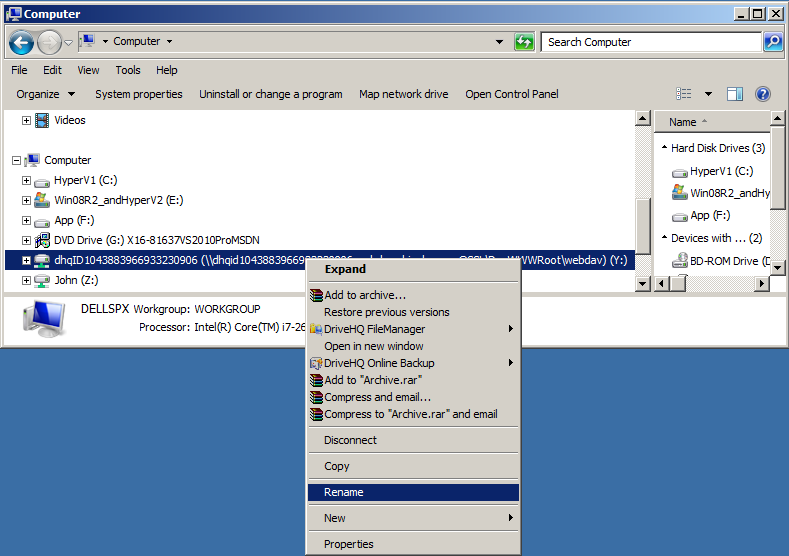 Like other drives, WebDAV drives support drag & drop, copy & paste. However, when copying files from a WebDAV folder to another WebDAV folder on the same WebDAV drive, Windows Explorer downloads the files to local then uploads them back to DriveHQ. 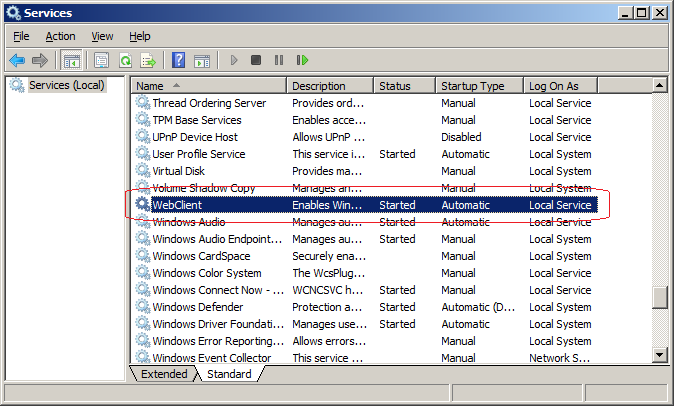 It is really a defect of Windows Explorer. (DriveHQ WebDAV server supports more efficient file copying.) Cut & Paste (or Move) Files/Folders does not have the same problem ?the files / folders are moved directly on the WebDAV server. When you open a folder in Windows Explorer, Explorer will try to create file / folder previews for many types of files, such as images, videos, PDF files and office files. Thus Explorer may download those files in the background. If the folder is very big, e.g. if a folder contains thousands of image files, Explorer could create a lot of unnecessary download traffic, which could slow down the WebDAV drive and Windows performance. You can save a backup copy of database files on a WebDAV drive. However, to host an active database file on a WebDAV drive usually does not work well. 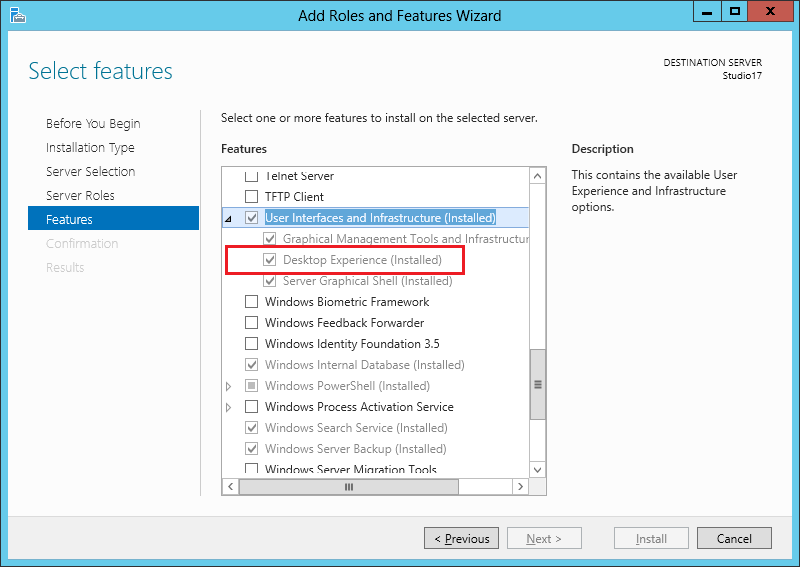 Database system performance is extremely sensitive to the storage system performance. Unfortunately, WebDAV drive is many times slower than a local drive, it usually does not meet database system performance requirements, unless your database file is very small and there is little or no load to the database system. DriveHQ Enterprise WebDAV Drive Mapping Service has many advantages; however, there are a few inherent problems that cannot be resolved by DriveHQ alone. For enterprises, it is recommended using WebDAV mapped drives for directly accessing office documents, PDF files, text/HTML / graphic and other small files. 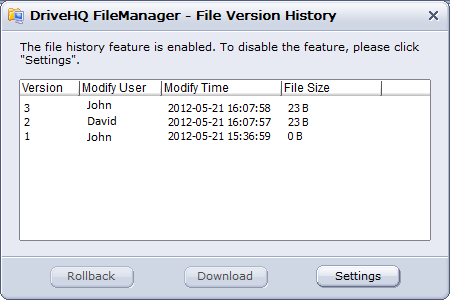 For directly accessing very large files or folders, it is recommended using DriveHQ FileManager. Also, WebDAV requires an available Internet connection. If you need to work on your files offline, then you can use DriveHQ FileManager's enterprise folder sync feature. Instead of syncing all your cloud files as is the method with Dropbox and other popular providers, you can sync any cloud folder with any local folder. Businesses can use DriveHQ WebDAV Service to replace their local file servers and Share Point servers. They just need to use DriveHQ's Group Account service or Enterprise service. They can create and manage sub-accounts & sub-groups using the "Group Admin" tool on DriveHQ.com website. They can allocate storage space and download bytes to their sub-users if they want them to have personal storage space (this reduces the group owner's storage space and download bytes). They can also allocate 0 bytes of storage space and download bytes to their sub-users; they can then create folders in their own account and share different folders to different users with different permissions. A sub-user can map a WebDAV drive using his own WebDAV URL. He can then access the shared folder in the special virtual folder: "\DriveHQShare" A sub-user can also directly map a shared folder as a network drive. When a sub-user accesses a folder shared by the group owner, he uses the group owner's storage space and download bytes, therefore his own storage space and download bytes can be 0. You can use any web browser to access your files on DriveHQ. Moreover, DriveHQ has native applications for MAC, iPhone, iPad, Android and Windows Phone. You can also use any 3rd party WebDAV or FTP client software to access your files on DriveHQ. DriveHQ Cloud IT system supports file versioning. Therefore, our WebDAV service also supports file versioning. 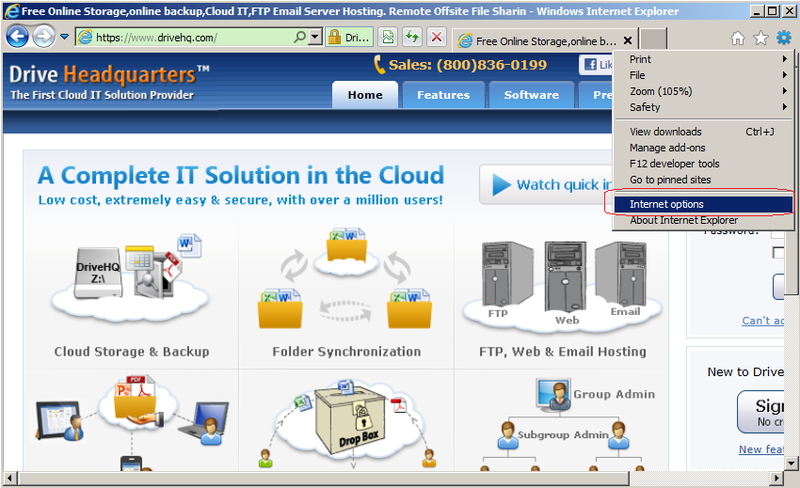 You can turn on or off file versioning feature from DriveHQ.com website. Just logon www.drivehq.com, go to My Account page, then click on Account Options. From this page, you can turn on file versioning and set the maximum number of versions to keep. Right click on a file and select History. If the file has older versions, it will be displayed in the file version dialog. 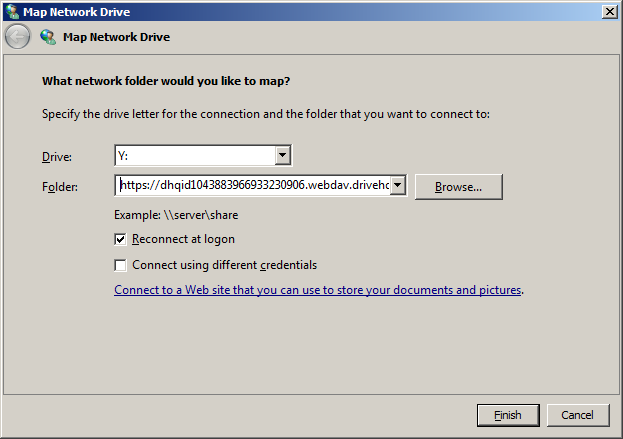 DriveHQ Enterprise WebDAV Drive Mapping service supports file locking, e.g. : if multiple users open the same Excel file, only the first user can edit the file. After the first user has finished editing and closed the file, the other users will be notified about the changes. In certain cases, file locking may cause some inconvenience, e.g. if a user locked a file, and if he forgot to unlock it (or if his computer crashed), then the file is locked and other users cannot edit the file. In this case, the file owner or the lock owner can logon www.drivehq.com website and go to My Storage page, then click on Lock List to see a list of locked files. He can then manually unlock a file. Please see the screenshot below. - WebDAV on Windows XP and Windows 2003 does not support HTTPS/SSL. You must use HTTP-based WebDAV URL. Therefore it may not be secure enough if you need to transfer sensitive data. You cannot map two WebDAV drives using different usernames. - You cannot create or open a folder / file whose name contains some special characters such as & and %. (These problems have been resolved in DriveHQ Enterprise WebDAV Service). - Most other WebDAV services do not support enterprise file and folder sharing (ACL-based sharing). © 2003-2018 DriveHQ Inc., all rights reserved.